BYZANTINE. 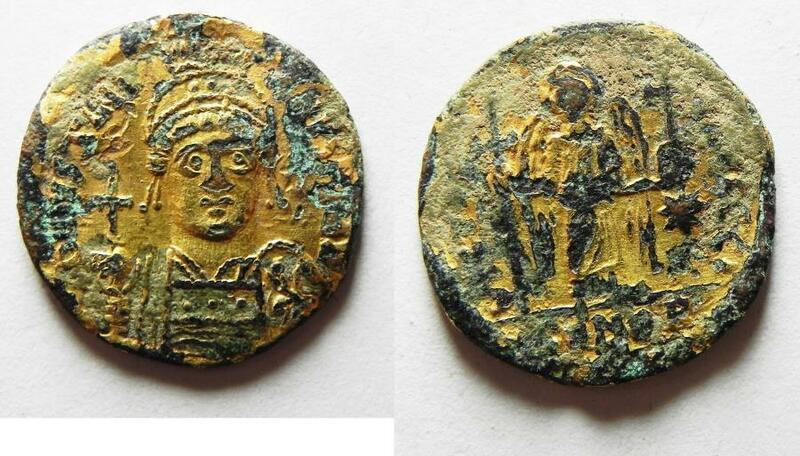 Justinian I (527-565) AV plated AE solidus (19mm, 2.44g). Contemporary counterfeit of Constantinople mint issue struck 527-538. BYZANTINE. Justinian I (527-565) AV plated AE solidus (19mm, 2.44g). Contemporary counterfeit of Constantinople mint issue struck 527-538. D N IVSTINIANVS P P AVG; helmeted, diademed and cuirassed bust of Justinian I facing, holding spear and shield / VICTORIA AVGGG; Angel standing facing, long cross and globus cruciger; to right, star; //CONOB. DOC 3; MIB 5; SB 137.